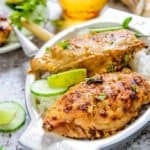 Chilli Mango BBQ Chicken is an inviting mango and chicken based dish that is served with steamed rice and various sauces. Once the oil is hot, add onion, garlic and ginger and cook for 3-4 minutes. Add mango, tomato ketchup, sugar, lemon juice, Worcestershire sauce and red chilli and cook for another 3-4 minutes. Blend the mixture to make a smooth sauce. Add chicken breast in the sauce and let it marinate for 10-12 hours in refrigerator. Arrange the chicken breast on the grill pan and grill from both the sides to sear the juice for 4-5 minutes on each side. Arrange the chicken breast on the baking tray. Flip the side and bake again for 20-25 minutes until chicken is done is slightly browned. Baste the chicken breast with the remaining marinade 2-3 times during the process of grilling. Heat the remaining marinade with little water to make a sauce. Serve the chicken over steamed rice. Pour the sauce on top. Enjoy cooking Chilli Mango BBQ Chicken from WhiskAffair. Try more authentic tried & tested recipes from https://www.whiskaffair.com.